LEEDS, AL (June 25, 2012) - KLR Group/Spyke’s Harley-Davidson’s Kyle Wyman won a thrilling back-and-forth contest with Bartels’ Harley-Davidson/Scrubblade rider Tyler O’Hara Sunday at Barber Motorsports Park to earn his second straight AMA Pro Vance & Hines XR1200 series race by a slim 0.047-second margin. Wyman and O’Hara checked out at the front of the field at the start of the race, with polesitter O’Hara losing the lead to Wyman at the end of the first circuit. O’Hara and Wyman then traded the race lead back and forth over the next three laps, with O’Hara maintaining the front position on laps four through ten until Wyman made his race-winning move on the final trip around the 2.3-mile track. “It was a lot of fun up front, dicing and battling back and forth with Tyler,” Wyman said. “There were areas he was a little stronger than me and other spots where I was faster. It was a great race; the first I’ve ever won where drafting wasn't a big factor. The last lap set up perfectly. I passed in the Museum Corner and then rode as tight a line as I could the rest of the way in. I didn’t want to give him any space because I knew he’d pass me [back] if he could. Equally spirited was the three-way race for the third step on the podium that developed between MOB Racing’s Michael Barnes, Deeley H-D’s David Estok and Kuryakyn’s Gerry Signorelli, who worked his way up to fourth on lap nine before crashing out of the race on the penultimate lap. Barnes’ ultimate margin over Estok for third was 0.146 second. Further back, Benjamin Carlson (Suburban Motors H-D) took the fifth position ahead of Michael Corbino (XP Motorsports/Rossiter’s H-D) and Harv’s Harley-Davidson’s Travis Wyman. Josh Chisum (Bartels’ H-D/Scrubblade), Nicholas Hansen (Suburban Motors H-D) and Brice Cooper (Hoban Brothers/Woodstock H-D) rounded out the top ten. 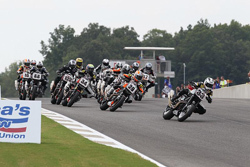 The next round of the Vance & Hines XR1200 series is July 14-15 at Mid-Ohio Sports Car Course in Lexington, Ohio, which will be the final opportunity to set the top ten competitors who will battle for the XR Showdown over the final four events of the season beginning with the doubleheader at Indianapolis.